A study by dental experts regarding how oral bacteria greatly affect the overall health of the body has become a hot topic in the United States. The Society of Internal Medicine in Dentistry was founded based on the findings that many lifestyle diseases are caused by bacteria entering the body through blood vessels in the oral cavity. The awareness that good oral care is essential to maintaining and preserving good comprehensive health is also rapidly growing in Japan. Most people only go the dentist periodically to prevent teeth decay and when they have a cavity. 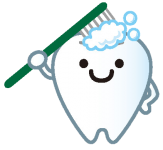 However, daily self-care is critical, as not brushing your teeth for even a single day can cause oral bacteria to rapidly multiply to the point of saturation. Consequently, the quality of the toothpaste that you use has a major effect on your oral environment and health. Even when not swallowed, the mouth slowly absorbs substances through sublingual and percutaneous absorption. While many toothpastes contain petroleum-based surfactants and chemicals to increase cleansing abilities, it is essential to use to use a safe toothpaste in your daily oral care, especially one which has a safety level equivalent to that of a food product. BIO PASTE only contains naturally-derived ingredients so that it can be used free of worry in your daily oral care. Its food-grade safety level provides complete peace of mind even when mistakenly swallowed. It does not contain any petroleum-based substances or abrasives and cleans your teeth employing only natural ingredients to maintain good oral health. Biominerals are minerals extracted from seawater and plants, and the Biominerals have magnified cleaning effects because of the vibrations on a molecular level. Its high alkalinity value has a pH of over 10 and causes stain particles on teeth to rise, effectively whitening your teeth and removing even the most persistent stains and coloring on teeth from coffee, wine and nicotine tar. BIO PASTE in paste form has a very high Oxidation-Reduction Potential (ORP) of approximately -200mv. As a result, it has the ability to quickly reduce the acidity in the mouth which prevents bad breath. In addition, it also works to prevent cavities by optimizing the balance in the oral environment in which harmful bacteria can reproduce. The abundance of negative-electric charges which provide the high ORP also coats the surface of the teeth and prevents the re-adhesion of stains. This restricts plaque and tartar from forming and helps maintain good dental health. Not only can BIO PASTE be used as a toothpaste but it can also be effectively used as a mouthwash. Its strong alkalinity immediately “resets” the acidic environment which causes the erosion of tooth enamel that commonly follows a meal.